Pre is the hottest name in running memorabilia today. Anything related to Steve Prefontaine commands a premium in the current market. Just to establish a benchmark for the value of Pre items, let's look at some examples of actual sales that have occurred at auctions and privately. The most notable recent sale was the auction of a 1970's poster, autographed by Pre. The seller had met Steve while he was making an appearance at a local running store in Tacoma, Washington in the early '70s. The 2' x 3' poster was signed by Pre and then forgotten in a closet for the last 25 years. Detail of Pre's autograph on the lower right of the poster. At the auction the bidding escalated rapidly, until finally settling at $560.00! Even the buyer was surprised by the price. He said, "I thought the poster price was pretty high. I wanted the poster because I had seen two movies about Pre. I think Pre is like the Ali or Jordan of track and field, with one exception, he did it for the love of the sport, not for the big money. It's hard to put a price on something this special." A collector died recently and his lifetime autograph collection of over 6,000 items, some dating back to the late 1800s, was broken up and sold. Part of that collection, a 3"x 5" notecard signed by Pre, was purchased for $200.00. A commonly found item that still brings a good price is the June 15, 1970 issue of Sports Illustrated. Titled "America's Distance Prodigy", it shows the Oregon freshman in his only SI cover appearance. This issue with a mailing label attached regularly sells in the $20.00 - $40.00 range. If your issue has NO mailing label and is in excellent condition, it could be worth $100.00 or more. *Update March 6, 1999 Kenny W writes to tell us he sold an unlabeled copy for $202.50 at auction. We are stunned! Pre is fifth from the right, in yellow and green. In 1971 GAF Viewmaster produced a set of three reels highlighting the 1970 NCAA Track & Field Championships. Pre competed as a freshman in the 3 mile. Steve had cut the bottom of his right foot while running around a motel swimming pool - six stitches needed to close it. "Pre" had spent four days in bed, his foot wrapped in a Baggie. For the NCAA meet, they taped it and hoped the wound would not reopen. If it did, Prefontaine said he would keep going until he "finished or ran out of blood." Pre won in a meet record of 13 minutes 22 seconds. These reels sold for $44.00. Usually Viewmaster reels from this era go for $5 to $10. The buyer said, "It was a total impulse purchase. Since the package was still sealed I was just guessing that there would be a picture of Pre in there. I probably paid too much, but I've never seen this before. When would I find another one?" Steve Prefontaine appears on two 1978 Sportscaster Cards, part of a 2,000 card set that includes almost every sport imaginable. These cards are relatively common, but lately the Pre issues are being snapped up. The card on the right is printed in Finnish and has sold between $15 - $40. The wider price range seems to stem from the perceived rarity on one hand, and the handicap of unreadable text for most collectors on the other. A copy of Pre's senior class yearbook from Marshfield High School in Coos Bay, Oregon, was recently auctioned off. In addition to his senior portrait the yearbook has photos of Pre in action for the track and cross-country teams. The fact that there is a price tag attached to items connected to Steve Prefontaine can seem a bit too commercial, but really it's unavoidable. Anyone who has had the impact on his sport as Pre has, and who continues to be an inspiration to generations of athletes, will be be revered and valued, even in the most basic of ways. 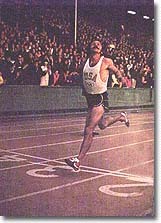 At a minimum we can be certain that Steve Prefontaine's story will not be forgotten.